Fortune, Courage, Love: Arts of Africa’s Akan and Kuba Kingdoms from the Virginia Museum of Fine Arts highlights the spectacular arts of African royalty. 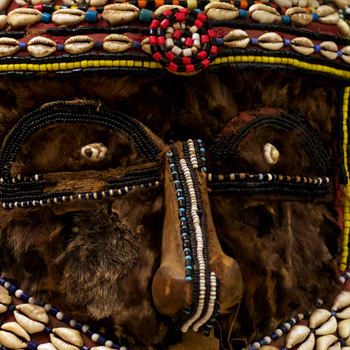 Culled from the Virginia Museum of Fine Arts’ extensive collection of African art, this exhibit presents a wide-ranging view of the cultural history and art of Africa. 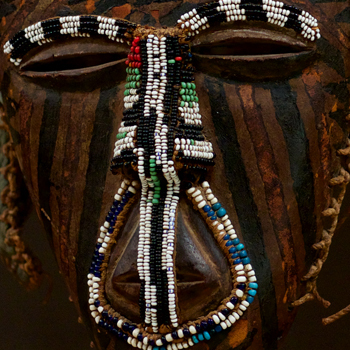 Linking history, statesmanship, and tradition, this exhibition will focus on the extraordinary design of regalia and related arts of the Kuba kingdom in the Democratic Republic of Congo, the Djenne people of Mali, and the kingdoms of Ghana’s Akan people. Before the period of European colonialism, Central Africa witnessed the growth of many cultures and kingdoms. However, many of these kingdoms did not survive after colonization with few exceptions such as the Kuba kingdom, it is unique in that it pre-dated colonialism and lasted well into this century. Formed in the early 17th century by Shyaam, the adopted son of a local queen, groups of villages and small chieftaincies were united by his knowledge of foreign customs and technologies. The art of the Kuba is world famous, and the artisans worked mainly with textiles, wood and metals. Kuba cloth, which is exhibited in this collection, is a textile woven from the leaves of the Raffia Vinifera palm and its production is a multistage process that involves all tribe members participating in its creation. Woodworking skills were utilized when creating containers, masks, and sculptures. Mastering the ability of smelting metal allowed the kingdom to forge weapons and tools used by tradesmen, professionals and warriors. The exhibition also focuses on the Akan of Ghana, located along the Gold Coast of West Africa, an historically important ethnic group because of their control of the gold trade. Originally the Akan people migrated south from the Sahel region to the coast as early as the 12th century into what we now refer to as Ghana. An inland chief named Osei Tutu unified the Akan from separate states into one kingdom in the early 18th century; from this point forward the Akan were one of the most powerful cultural groups within West Africa. The Akan kingdom was active in the trade of gold, cloth, and slaves. These forms of trade brought great wealth that promoted the kingdom’s rich artistic traditions. The art of the Akan joined the verbal and visual by representing spoken proverbs of the culture, many of these motifs were used to show the cohesion and wealth of the kingdom. To the Akan, art was not only created for an aesthetic purpose but it was also created to translate philosophical ideas. The gold-weights displayed in the exhibition embody this philosophy, offering proverbs containing an array ancestral wisdom. 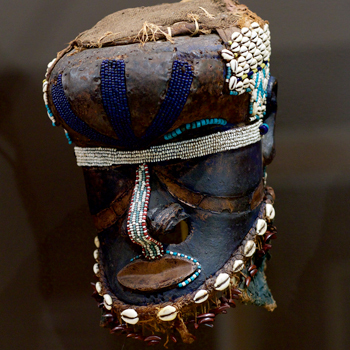 Fortune, Courage, Love: Arts of Africa’s Akan and Kuba Kingdoms from the Virginia Museum of Fine Arts also presents the West African country of Mali and the Djenne people. Djenne of Mali was known as one of the three major trading hubs of West Africa along with Gao and Timbuktu. In this exhibition, many of the objects are made of copper alloy and brass in the form of bracelets and pendants. Bracelets are worn for multiple purposes beyond personal decoration. They are used to indicate an individual’s role and profession in society, and to identify what family, clan or village a person is from. Jewelry of this culture is made by smiths who embed spiritual power within these objects to protect the wearer from disease, to bring love, and increase fertility. Presenting stunning design of royal objects and related arts of the Kuba, Djenne, and Akan people, Fortune, Courage, Love will invite further exploration into the artistically rich cultures and customs of African kings. Fortune, Courage, Love: Arts of Africa’s Akan and Kuba Kingdoms from the Virginia Museum of Fine Arts has been organized in partnership by the Virginia Museum of Fine Arts and was curated by Leila Cartier, Curator of the William King Museum of Art in collaboration with Richard B. Woodward, Curator of African Art at the Virginia Museum of Fine Arts. It will be on display in the American Art Gallery and the Susan Macdowell Eakins and Thomas Eakins Gallery from September 26, 2015 through January 3, 2016.